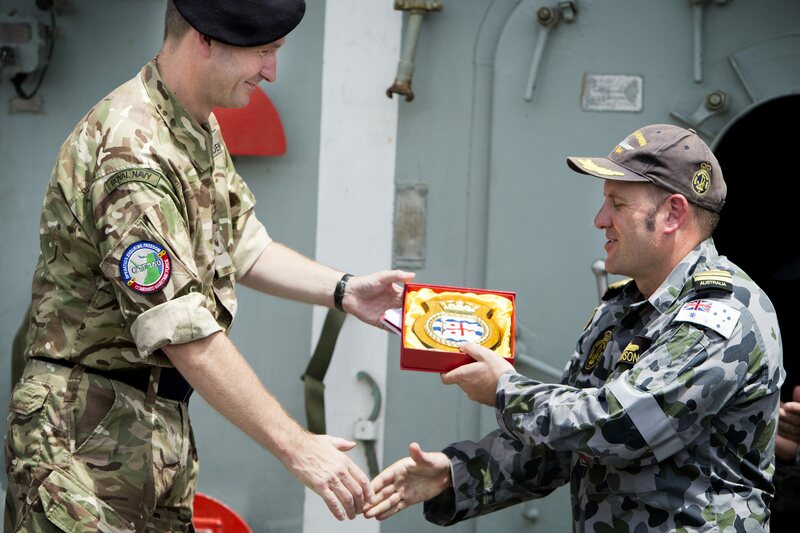 HMAS Darwin’s contribution to operations in the Middle East as part of Australian Operation Slipper was formally recognised during a visit to the ship on 2 July by Commodore Jeremy Blunden Royal Navy, Commander of Combined Task Force 150 (CTF-150). 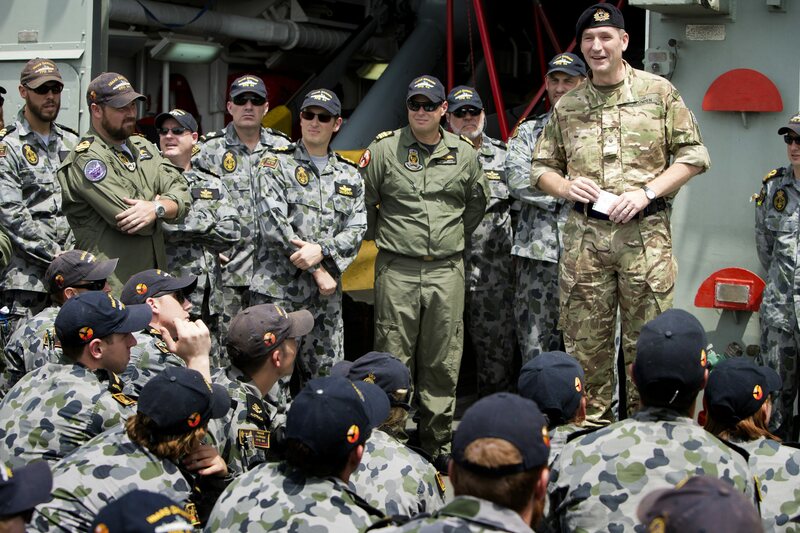 Commodore Jeremy Blunden Royal Navy, Commander CTF-150 addresses the crew of HMAS Darwin. The Sydney based frigate has been deployed to the Indian Ocean since March 2014 and has supported the counter-terrorism task force, CTF-150, as part of the Combined Maritime Forces (CMF), a maritime coalition of 30 nations based in Bahrain. An Australian sailor throws a heaving line from HMAS Darwin. Commodore Blunden highlighted the efforts of all the ship’s departments in achieving so much. He noted the continued determination and professionalism displayed by the boarding parties during long and demanding searches and the efforts of the engineering and logistics departments who have sustained very good levels of support to operations. “This has been a real team effort”, said Commodore Blunden. During this deployment Darwin has seized 1,675 kg of heroin and 10,647 kg of hashish in eight boarding operations. On 24 April, the ship achieved the largest ever seizure of heroin at sea when 1,032 kg were found on a dhow off the coast of east Africa in international waters. On 28 June the ship seized 6,248 kg of hashish from another dhow in the Indian Ocean, one of the largest amounts of hashish found by a warship operating as part of CMF. Commodore Jeremy Blunden Royal Navy, Commander CTF-150 presents a crest Commander to Terry Morrison, Commanding Officer, HMAS Darwin. Commodore Blunden urged Darwin’s crew to continue to add to their record breaking success during the final few weeks of her deployment. “When you get to go home, you can be very proud of what you have achieved,” he said. CTF-150 conducts maritime security operations in the Indian Ocean to deter terrorism and promote peace and security. 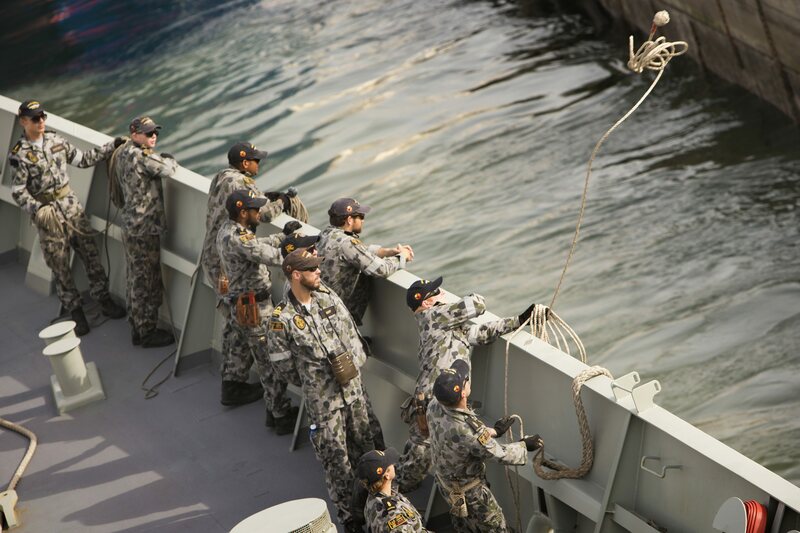 It is one of three principle task forces operated by the Combined Maritime Forces, a multinational naval partnership of 30 nations based in Bahrain.